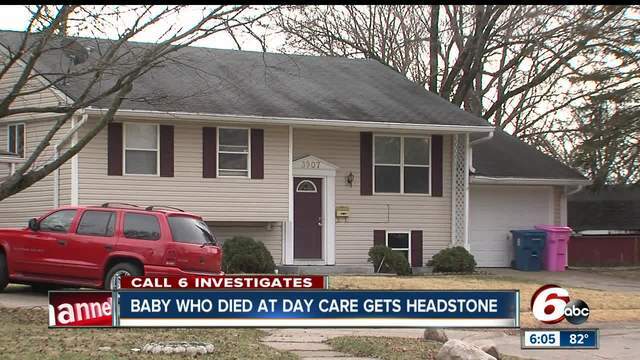 INDIANAPOLIS -- A five month old baby who died at a suspected illegal child care operation is finally getting a headstone. Kyle Davis-Ferguson stopped breathing on February 16 inside a home on Elmonte Court. He later died at a hospital. This week, He Knows Your Name ministry, donated a gravestone to Kyle. Founder Linda Znachko said she did it to help Kyle’s mother and siblings. The Indiana Attorney General’s office filed court documents to stop the suspected illegal home child care operation on Elmonte Court. Documents show Kyle was in an unsafe sleep environment on the bottom bunk of a bunk bed. Mischa Bennett, a convicted felon, was watching Kyle and about nine other children at her home on Elmonte Court on February 16, according to court documents. When inspectors stopped by May 30, no children were at the home, according to Jeremy Brilliant, spokesperson for the Attorney General’s office. Marion County prosecutors decided not to file criminal charges in baby Kyle’s death. Znachko said Kyle’s mother is still struggling to find answers on what happened. The ministry has donated more than 100 headstones in eight states. Kyle’s headstone is valued at more than $600. Mischa Bennett did not have a license to operate a child care home, according to the state. • Use your eyes and ears when visiting. Are they following safe sleep? Is equipment working? Are children strapped into their high chairs? • Ask to see the provider's license or registration, which should be posted in a public area. If the provider is on probation, it will say so on the license, along with the reasons why. • Ask what their current child-to-staff ratio is. Experts say accidents are more likely to happen when staffers are watching a lot of children. • If you use an unlicensed facility, know they do not have to submit to background checks, CPR training, safe sleep training and other requirements. Ask to see proof your provider has completed these.